Lexington Green residents keeping a close eye on Buffalo Creek. 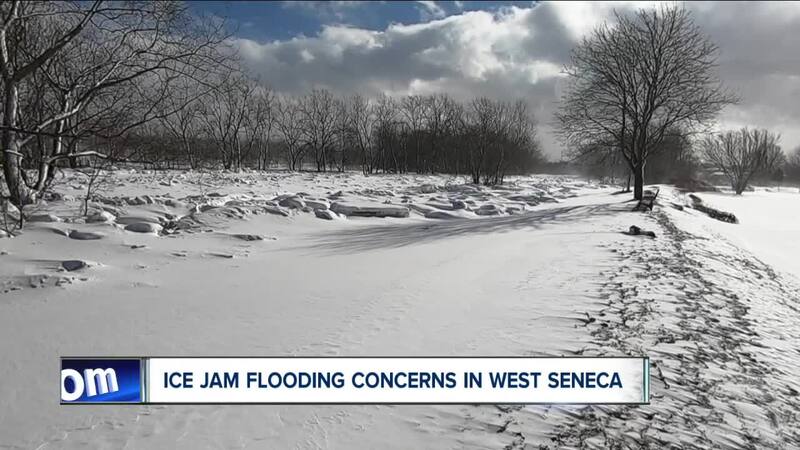 WEST SENECA, N.Y. (WKBW) — Even as Western New York recovers from a blizzard that blew through causing widespread problems, people in West Seneca are preparing for another weather concern: ice jam flooding. A quick thaw is expected over the next few days with temperatures going well above normal. The sudden run off of melted snow combined with chunks of ice in the creeks can create a dam situation where water overflows its banks. Buffalo and Cazenovia Creeks are two problem spots where problems have occurred in the past. Cazenovia Creek, near the Southgate Plaza, does not appear to be a problem at this point, according to West Seneca. However, Buffalo Creek has many people nervous because of its location near residential homes in the Lexington Green neighborhood. In 2014, ice jams on Buffalo Creek sent frigid water and ice boulders crashing through yards and homes in Lexington Green. Some people had to be rescued from the second floor of their homes by high-lifts. Many others saw cars, basements, foundations and personal belonging destroyed. Making things worse, many homeowners did not have flood insurance for the neighborhood's millions-of-dollars in loses. After the 2014 flood, a berm created with stone/concrete filled sacks was placed behind homes that were most susceptible. The Harlem Road bridge was also rebuilt to prevent ice jams at that location. West Seneca Supervisor Sheila Meegan said she is hoping those measures, and others, will help this time around. The town is planning to bring in a long-armed, mechanical boom to break up ice at Harlem Road. Sanitation crews, unable to pickup trash during the blizzard, have been filling extra sand bags which are being supplied free. Pumps are being deployed with requests for Lexington Green residents to make sure street drains are clear. "We will be sending out a Code Red to the neighborhood," said Meegan. Buffalo Creek enters into the Buffalo River. On Friday February 1st, the Buffalo Fire Boat "Edward M. Cotter" will begin ice breaking operations on the Buffalo River in hopes of keeping the water moving. 7 Eyewitness News Reporter Ed Reilly has more in the attached story.